The Centre incorporates our purpose-built super hangar containing the Concorde G-BOAC, legendary flagship of the British Airways’ fleet. The hangar is ideal for large meetings, dining and exhibitions under the wings of the world-famous aircraft. With 1600m2 of space and seating capacity for 700 people, this is an impressive venue to stage your corporate event. Within the main building there are two smaller meeting rooms for 40 and 50 delegates (theatre style), ideal for breakout sessions. For a real aviation flavour and a memorable event, you also have access to the aircraft and cabin interior of a DC-10. 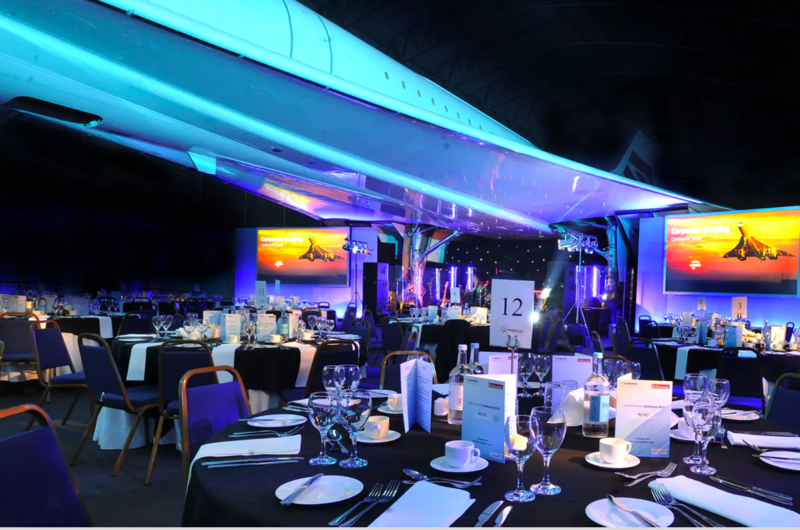 The Concorde Conference Centre at the Runway Visitor Park caters for product launches, gala dinners, team building events, exhibitions or meetings - all taking place around one of the world’s most famous icons. "Thank you to the team at the Manchester Runway Visitor Centre. It was our first time using the venue and based on our experience we wouldn't hesitate to return at a later date. The staff friendliness, facilities and food/beverages throughout the day was top notch and our tour of the world-famous Concorde topped the day off nicely! Thank you to everyone involved, we'll be back soon. Thanks,"
"The service from Concorde Conference Centre we received from the booking of the venue through to support whilst the event was running was exceptional. Having our product showcase underneath Concorde was amazing!" "This was the second time we have held our 'Explanation' Seminar at this venue and both times have received very positive feedback from our attendees. We have found that this unique venue really helps our name and our content stick in people’s minds." "The knowledge and expertise of our Concorde tour guide alone made it a great experience to share with our customers. A really memorable, brilliant experience that enhanced the impact of our event." "Good venue, nice staff and good service - Thank you"
"It was a brilliant day, facilities and organisation were second to none and the team thought the Concorde tour was out of this World. Thank you for making the meeting memorable and successful."